Thanks to the most recent construction techniques, it is now possible to build extremely resistant floor slabs with small thicknesses. This is the case with fibre reinforced concrete, which is becoming more and more popular in hollow bricks and concrete floors. Tecnaria has developed specific connectors. FRC (Fibre Reinforced Concrete) is a cement based (concrete or mortar, single or multi component) composite material, with added fibres of various types and geometries. This composition gives the concrete a high level of resistance to traction and compression, significant ductility, and higher shear resistance than traditional concrete. Regulations do not currently provide a clear view of all the possible fields of application of fibre reinforced concretes in the structural sector, as they are not strictly classed as concretes. They have recently been used for anti-seismic adaptation, or for the reinforcement of floors, to obtain rigid planes with smaller thicknesses (in the range of 25 mm) and limited weights, because of the advantages these factors both provide. In order to ensure the efficiency of the rigid plane, it is, however, still necessary to guarantee a certain level of binding with the existing structure, both when joining the beam to the slab, and the beam to the masonry elements. With this in mind, when reinforcing hollow bricks and concrete floors, some FRC manufacturers recommend carrying out extremely demanding preparation works on the surface being consolidated, such as the roughening of the support through mechanical abrasion, followed by cleaning and preparation of the surface with a primer applied with a roller. Connection is essential for surfaces with exposed hollow bricks as it is not possible to rely on the friction between the elements, or to safely quantify such friction level. 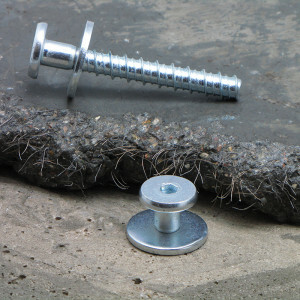 Tecnaria MINI CEM metal connectors are installed on the upper surface of concrete joists. All that is needed are simple drills. MINI CEM connectors have undergone extensive laboratory tests. Thanks to the specific head conformation and reduced heights (20 mm and 30 mm), they can be used with FRC.